The grounds include 95 RV sites with water and 30 amp. Many have sewer and a few have 50 amp. 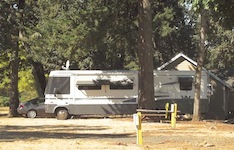 The use of RV sites is for group rental only. Not available for individual rental.